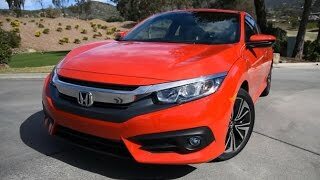 Honda took its Civic legacy a step ahead at the 2015 LA Auto Show by releasing the Honda Civic Coupe 2016. Recently they surprised the people by unveiling the 2015 Honda Civic Coupe concept and within a few months they undoubtedly nailed it. 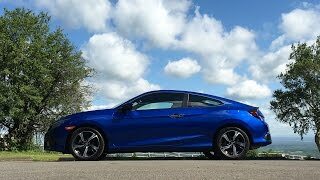 Let us have a look at the review of Honda Civic Coupe 2016 to know more about this production model. The interior of Honda Civic Coupe 2016 gets rounds of changes. The first thing that you might notice entering the model is the two-tiered dashboard featuring multiple screens placed haphazardly around driver. The instrument cluster includes digital gauges and a TFT screen mounted in center. There is a seven-inch infotainment screen mounted over dashboard. The system features Apple CarPlay and Android Auto. The screen also comes with Pandora app and supports SiriusXM and HD Radio. Apart from tech and luxury the interior also offers you lots of space. There is lots of room for passengers and for cargo also. 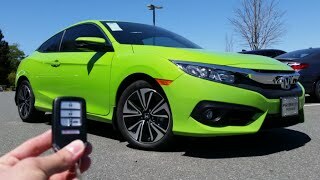 Thus the interior details of Honda Civic Coupe 2016 with the overhead LED lamp, contrast stitching and luxurious door panels make the scenario worth the time and money. The exterior of Honda Civic Coupe 2016 brings many features that the company introduced with the concept version. Starting with the front fascia there is a funky grille matching to the one we saw in sedan version while the LED lamps splatter ‘tiger-eye’ like stance adding to the aggressive looks. Beneath the set up is redesigned bumper that has a trapezoidal air dam in center while the two air ducts on either side have fog lamps integrated on the fenders. The rear end is mounted with C-shaped LED taillights marking their presence almost to the entire rear portion. There is a decent spoiler over the trunk, adding to looks and performance. 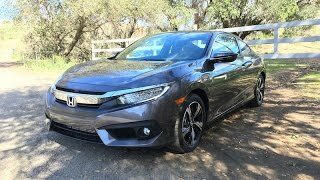 In all the exterior of Honda Civic Coupe 2016 is a lap ahead of the predecessors and has all attributes to compete with the growing automotive world. 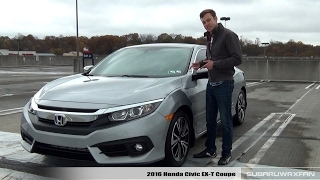 Beneath the hood of Honda Civic Coupe 2016 are two powertrain options; first is a 2.0 liter four-cylinder engine generating total output of 158 hp and peak torque of 187 nm mating to CVT or six-speed manual transmission while second is a 1.5 liter four-cylinder engine cranking total output of 174 hp and peak torque of 220 nm paired to CVT transmission. The performance figures of Honda Civic Coupe 2016 are yet to be revealed and we assure you to share the details as soon as we get them.